Some time ago, on my way to Changi Airport; the area near Marina Bay Sands was still under construction. Then, a couple of months ago, I started to see some pictures of some giant trees on my friend’s Facebook photo album, but I didn’t really pay attention to it. But then I kept seeing the pictures on my other friends’ Facebook lol! Some took the photos during the day, some got a chance to took photos in the night when the light is on and makes that giant trees look more beautiful. 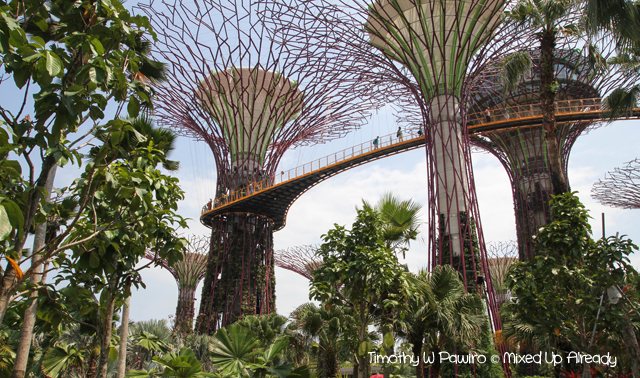 Yes … I am talking about the Supertree Grove in Garden (Gardens) by the Bay in Singapore. 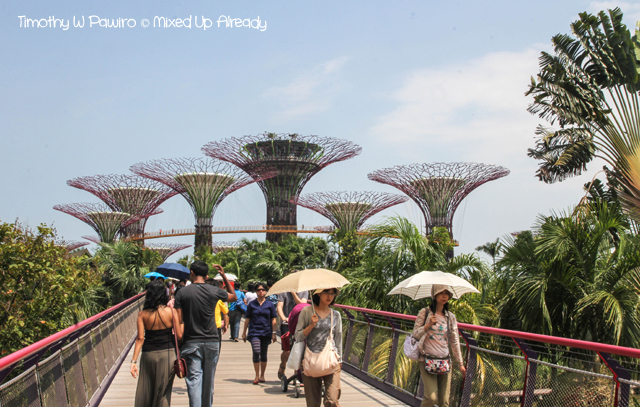 Going to the Gardens by The Bay is easy! This is Singapore, so going anywhere is easy ;). So from the place that I stayed in Bras Basah road, we just took the MRT and alight in Bayfront MRT station and then just followed the direction to Gardens by the Bay. That day, the weather was quite hot. 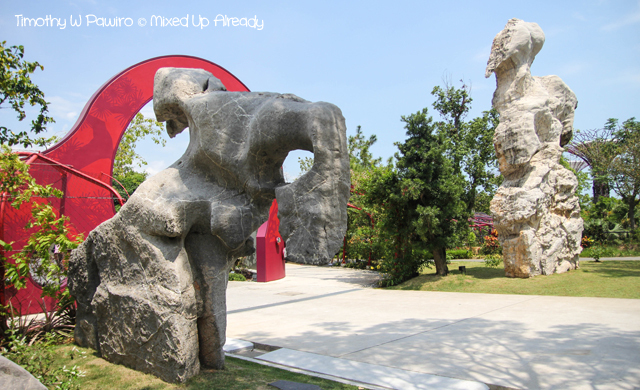 Even though some part of the area is covered by the giant man-made tree, it’s still only a small part of the gardens, not all the area, so it’s better for you to bring an umbrella or hat if you decided to visit there during the day. 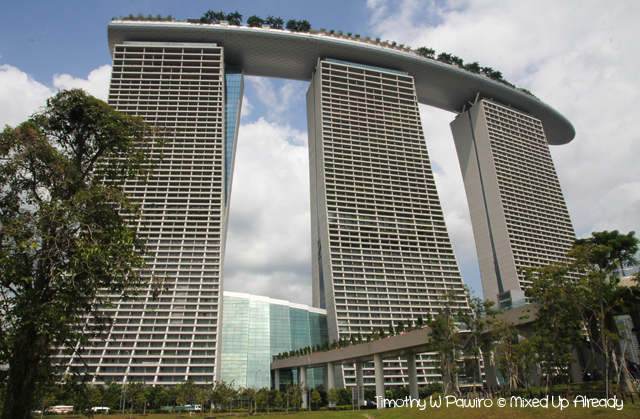 We even entered the Marina Bay Sands for a moment just to cool down and have lunch there before we continued to explore the garden :D. Marina Bay Sands is connected to the garden with a bridge called Dragonfly Bridge. The bridge is just near the exit from Bayfront MRT station. 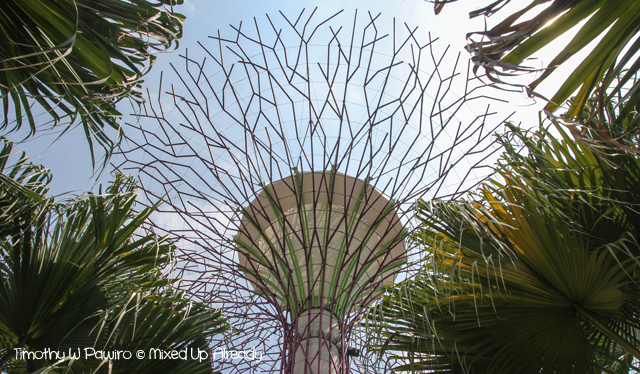 The gardens itself has many things to see not only the supertree grove, but they also have some other outdoor attractions too, such as Heritage Gardens. 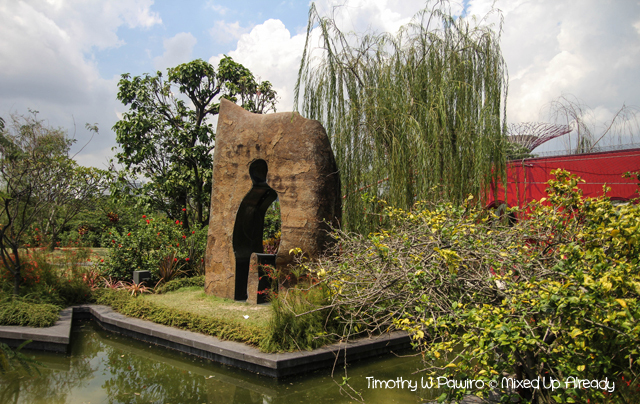 In part of the Heritage Gardens, there’s a sculpture of a human cutout (Li Xiang), which represents the Chinese that ventured out to the foreign land. 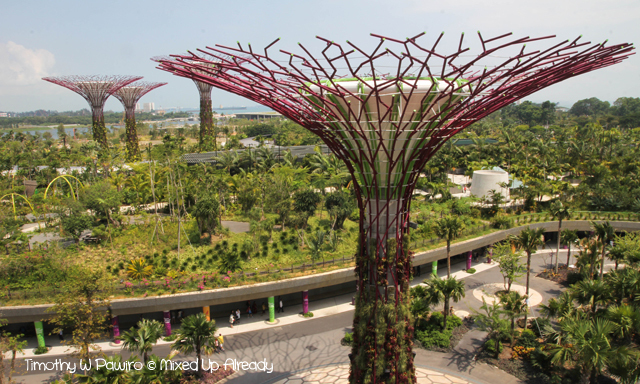 Besides outdoor attractions, they also have some indoor attractions such as Flower Dome and Cloud Forest, which are perfect for cooling down during the hot day! 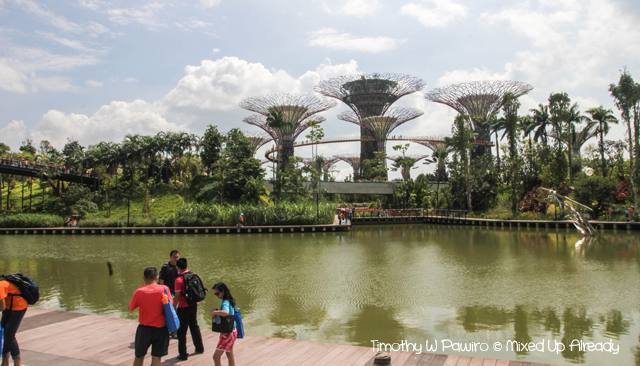 I didn’t went inside the Flower Dome and Cloud Forest though, we only spent most of the time at the Supertree Grove and then had a light meal in the food court (indoor with aircon! haha …) before we headed home. Talking about the food court; although they named their food court as Supertree Dining, it’s actually not located inside the supertree, but on the ground. 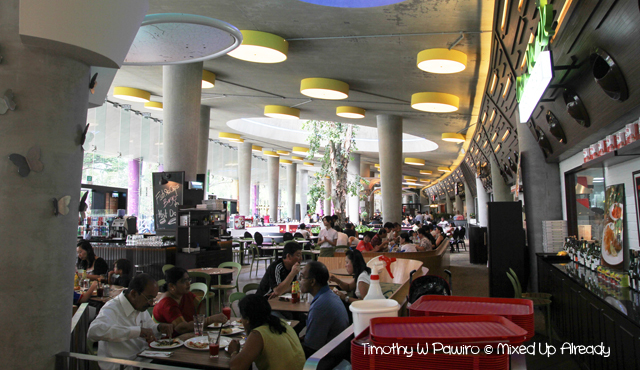 There are quite a few restaurants inside the foodcourt, including Texas Chicken ;). 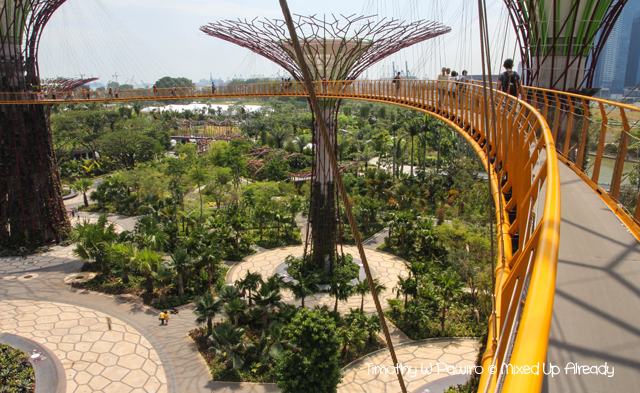 There is actually a restaurant that located in one of the supertrees, in fact it’s in the tallest supertree. The restaurant called IndoChine. 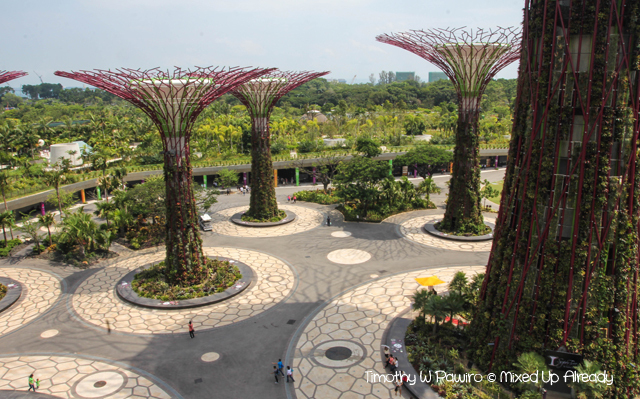 Going to the Gardens by the Bay during the night will also give a different view of the gardens. 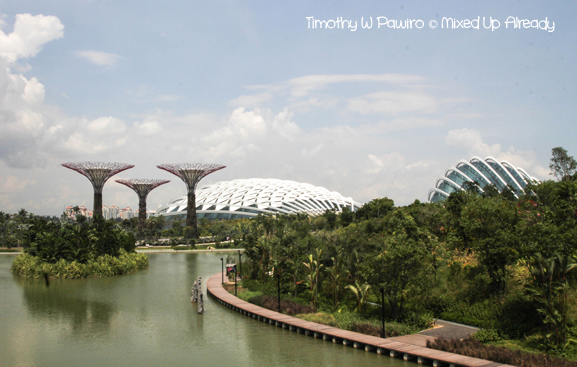 My friend, Daeng Rizam, has a post in his blog about Gardens by the Bay where he visited the gardens during the night. The post’s title is Glowing Midnight Supertrees. For information about the opening hours and admission fees, please go here. That place looks awesome!!! Love the photos. 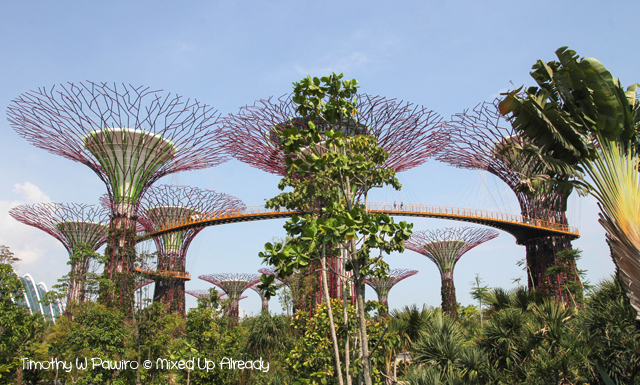 I’ve been wanting to visit Singapore for a while now…this may be the inspiration I need to go ahead and book my trip! Maybe I should check this place out if I go to Singapore again one day. Looks pretty interesting. Thanks for featuring my site on your post Tim! I’ve yet to go for the skywalk. Ouh was it closed already? And merry xmas to u Tim! Haha. I wish I have the time to go to Singapore for New Year. I am going to celebrate it here in KL. Maybe next time WE should ask him for that. Hahaha c.c Hero. Ihhh kakaaakk curannggg … Dpt voucher ga ajakkk2 … Huft! !